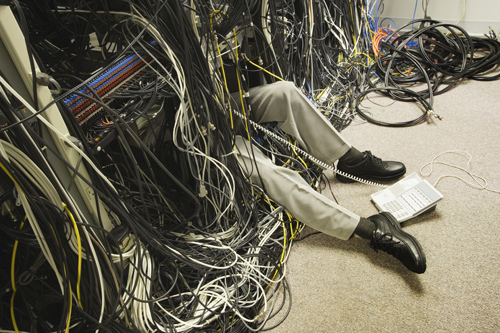 Isn't it about time to cut the cord to a few of those servers in the back room? Here are some apps that will help you do it. 1. Jungle Disk is software made by Rackspace, the cloud hosting company for businesses. Install it on your Mac or PC, and it automatically backs up every file on your computer (or whichever files you select) to the cloud. Backup happens automatically as your files change, so you don't need to press a "backup" button; it's always saving your stuff in the background. Reliable, sure, and also dirt cheap. Price: $4 per user per month (plus storage fees) for Workgroup edition. 2. Dropbox for Teams is the SMB-oriented version of the popular consumer software. Dropbox plants a "connected" folder on your desktop that looks and behaves like any other, except that its contents are constantly backed up to the cloud. Dropbox for Teams adds more flexibility: you can set permissions for certain users, and you can access older versions of each file you back up. While it's more expensive than the consumer version of Dropbox (which starts out at 2 gigabytes of storage for free and goes up to 100 gigabytes for $20/month), you get what you pay for: The software is super reliable and comes with a litany of mobile apps. 3. Echosign is a site that lets your business exchange and sign contracts electronically. It's almost an industry standard these days, so you get all the perks popularity affords: rock-solid software, security and familiarity. That said, it also gets expensive quickly when you add more users, so be choosy about who gets an account. 4. Postful turns email docs into good old fashioned paper letters and sends them for you. They print in full color, so you can also print and mail postcards, color documents and glossies, and you can use Postful's API to bolt its system right onto your company intranet (to make mailing out documents a one-click process). Better yet, Postful documents every outgoing letter you send, making it easy to manage batches of letters for mailing lists. 5. Shoeboxed collects your receipts and business cards, scans them, and loads them into your accounting or note-keeping software automatically. When you sign up, you get a certain number of Netflix-like prepaid envelopes where you stuff your receipts. Send them off, and they pop up in Quickbooks or Evernote in a few days. You also get a Shoeboxed email account where you can forward your electronic receipts for safe keeping. 6. Yammer is like a private, customized instant messaging service for your company, with a bunch of upgrades. Not only can employees share information and chat, but they can also transfer docs, work collaboratively, and query other people in the company for help or answers. As an organization scales, one roadblock for employees can be finding the right person to help. Yammer everyone — and especially your remote workers — connected. 7. TextExpander is like a stenographer for your iPhone, Mac or iPod touch. If you find yourself composing long docs on your handheld device, or taking furious notes at your keyboard, then TextExpander can save you serious carpal tunnel. It allows you to type common-sense abbreviations that are automatically expanded to full words (for example, type in "my address is" and it will add auto-complete your mailing address in-line). TextExpander is fully customizable, and it syncs your shortcuts across all your computers and devices. 8. Grooveshark is a no-brainer for any group of Web-connected workers. For $3 a month, you get unlimited access to all the music the Recording Industry Association of America can shake a stick at, plus zillions of other live tracks, leaked cuts, and remixes that users have uploaded themselves. But why do you need an office music service, really? Because it keeps your employees from being tempted to download music from torrents, which can get you in trouble. 9. Indinero is a cloud service that manages your finances and aggregates all your bank accounts in one place. Think of it like Mint.com for your business: Put in all your account logins, and inDinero pulls your financials in near-real time, spreading it out in graphs and charts so you can spot budgeting problems before they worsen, and share them with your account electronically. 10. Harvest tracks your employees' billable hours and makes online invoicing fast and centralized. With mobile apps and complete record-keeping analysis, employees can create visual reports of the business they're generating, track expenses for a project or client, or submit their timesheets or invoices for their superiors' approval before they're sent to the client. 11. Tripit is, at heart, a magical email address. Every time you get a flight or hotel confirmation in your email, simply forward it to plans@tripit.com and it will load your itinerary into a master itinerary, tracking complex travel plans all in one place. You can check your flight status and travel plans and get "push" flight alerts using the iPhone and Android apps, and better yet, Tripit automatically adds your travel plans to your Outlook or other Web calendar. 12. Hipmunk makes booking travel plans less of a headache by allowing you to play with your travel dates, times and locations on a big sliding graph, targeting exactly what you want among a huge matrix of options. It also lets you search in natural language -- no typing in airport call signs or selecting dates from some tiny calendar. It's also utterly ad- and clutter-free, making it easy on the eyes. What brilliant cloud apps do you use to run your business?